"Hard to believe papa was once a kid" goes an ad-line of a mutual fund scheme that invests in mid-cap stocks. Indeed it's hard to believe Infosys and Airtel were lesser-known companies 15 years ago. Today they are among the heavyweights of the country's two most well-known large-cap indices ' the Bombay Stock Exchange's Sensex and the National Stock Exchange's Nifty. There are many such names which were once small or mid-cap companies but are now prominent large-cap companies that have generated very good returns over the years for investors. Fast growing economy like ours with a liberalised industrial and services sectors, the chances of finding small and mid-level companies with potential to becoming large corporations are much better than the developed economies like the US and Europe. In this section, we try to zero in on some mid-cap companies with the potential to become large-cap companies in the next 5-10 years. We asked large brokerage houses to come out with their list of mid-cap companies that they believe have it in them to outperform others. Of the list of 40-odd companies that we received from different brokerage houses, we selected 10 companies based on their market-cap. Since our focus is on long-term growth, we ignored some of the short-term negative sentiment s specific to a sector or to a particular company. We have selected companies with a market capitalisation of less than Rs 20,000 crore. 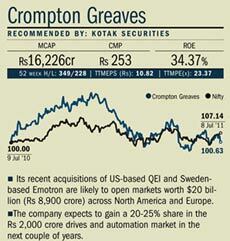 Crompton greaves, part of the $4 billion Avantha Group, is among the top 10 global players in the power transmission and distribution equipment space. It also has a notable presence in the consumer appliances segment. It recently acquired two overseas companies -US-based QEI for $30 million (Rs 133 crore) and Sweden-based Emotron for â‚¬8 million (Rs 50.4 crore), its ninth acquisitions in six years. The acquisitions give the company entry into spaces where it had no presence and the acquisition opens markets worth $20 billion (Rs 8,900 crore) across North America and Europe, according to the outgoing managing director SM Trehan. The company expects to gain a 20-25% share in the Rs 2,000 crore drives and automation market in the next couple of years. Performance and valuation: The company's consolidated net sales jumped from Rs 5,640 crore in March 2007 to Rs 10,005 crore in March 2011. In 2010-11, revenue grew by 9.5%. Net profit rose 11.6% to Rs 9,196 crore in 2010-11. In the previous year, the same grew by 46% to Rs 8,241 crore. Revenue for 2011-12 and 2012-13 is estimated to grow by 13.8% and 19.1% respectively. The company's net profit in the next couple of year is expected to grow at 12-15%. The stock is trading at a trailing 12 month price-to-earning (PE) ratio of around 24. Other stocks in the same segment such as Bhel, ABB and Areva T&D are trading at high PE levels of 15-25 times. Cummins India, the 51% subsidiary of US-based Cummins Inc, is a manufacturer of diesel and gas-based power generation systems. It is a key player in the diesel and gas engines space and supplies heavy automotive engines. The company has projected a revenue growth of 20% in 2011-12, driven mainly by domestic demand. According to the company management, domestic sales, which contribute 75% of overall sales, are expected to grow by 25% in 2011-12. The company sees an exports growth of 15% next year. "Cummins India's cost-efficient manufacturing is driving outsourcing by the parent company." According to a Religare Capital report, the long-term value drivers remain intact for Cummins, in the form of a superior product profile with support from parent company Cummins Inc, strong distribution channels, and an improved profitability profile backed by productivity enhancement processes undertaken since 2005-06. "Cummins remains a relative outperformer in capital goods universe, owing to high earnings growth, strong cash generation and superior capital efficiency," says an Emkay Global Research report. According to Sanjeev Zarbade, vice-president, private client group research, Kotak Securities, the company's cost-efficient manufacturing is driving increased outsourcing by the parent company. Performance and valuations: The stock gave a return of 35% (Rs 509.55 on April 1, 2010 to Rs 684.55 on March 31, 2011) in 2010-11 and a 177% return (from Rs 183.20 to Rs 513.60) in 2009-10. The return on equity, or RoE (percentage of net profit to equity capital), for 2010-11 at 35% is the best among its peers such as Swaraj Engines (32%) and Greaves Cotton (29%). The estimated earning per share (EPS) for 2011-12 and 2012-13 is Rs 35 and Rs 40 respectively compared to Rs 30 in 2010-11. RoE is expected to be 33% for the next two years. It is a 50-year old public sector company specialised in defence technologies. Over the years, it has developed into a multi-product and multi-technology company. The company also manufactures telecom equipment, DTH set top boxes, simputers, switching equipment and electronic products. It is now planning to foray into nuclear power instrumentation business and solar power businesses as well. According to the company's management, its current order book is Rs 23,600 crore as against Rs 11,300 crore in the previous year. It expects another Rs 12,000 crore order for developing Akash Missile in 2011-12. The company has increased its research and development (R&D) outlay for the current year to Rs 400 crore or 7% of its current Rs 5,500-crore turnover, up from around 6% last year. Performance and valuation: In 2011 the company posted a 148% growth in net profit from Rs 324 crore in 2009-10 to Rs 804 crore. At trailing 12 month PE of 15.49, the stock is trading at a decent valuation. Strong order book and rising defence expenditure make this company a good long-term buy, says Sanjeev Zarbade, vice-president, private client group research, Kotak Securities. GMR Infra is in the business of developing airports, highways, power and special economic zones. It works on the public-private partnership model. It demonstrated its ability to execute big projects with the new terminal T3 at Indira Gandhi International airport in New Delhi. It has also bagged airport projects in Turkey and Maldives. The company is handling 10 power projects in different phases of development in several parts of the country. It is also building three road projects in south India on build, operate and transfer (BOT) basis. "The overall outlay of $1 trillion till 2017 stands proof of the potential in the infrastructure space." The company stands to gain from the government's recent focus on infrastructure. Vinesh Menon, deputy CEO, Online Investments & Stock Broking, Bajaj Capital, says "The overall outlay of $1 trillion for development of infrastructure till 2017 stands proof of the potential in this space." Valuation and performance: The company posted a 26% growth in revenue in 2010-11 at Rs 5,574 crore. However, it posted a loss of Rs 929 crore during 2010-11 as transaction cost on stake sale of Intergen, a US-based power generator. The company stock has fallen 20% from Rs 40.45 on April 1, 2011 to Rs 33.00 on July 8 and market watchers believe the share has bottomed out. Coromandel International, part of the Rs 17,000 crore Muruguppa Group, is in the business of fertiliser, crop protection, speciality nutrition and retail. The Secunderabad-based company recently acquired a 73% stake (42% promoter's stake and 31% through open offer) stake in Sabero Organics Gujarat, a Mumbai-based agrochemical company, at a price of Rs 160 a share and a non-compete fee of Rs 38.47 per share. Though the acquisition will contribute to just 5% of the Cormandel's revenue, it will benefit in the long run due to Sabero's presence in over 50 countries (exports contributed to Sabero's 55% revenue). The company has earmarked Rs 350 crore for expansion of its fertiliser manufacturing capacity in Kakinada. The new capacity at Kakinada is expected to start contributing towards the revenue in the second half of 2012-13. According to a Unicon Wealth Management report, Coromandel's growth trajectory would be supported by expansion of phosphoric fertiliser capacity in Kakinada, addition of 200 retail stores and healthy monsoon in 2011. Performance and valuation: The companys net profit for the quarter ended March 31, 2011 decreased by 11.51% at Rs 72.62 crore compared with Rs 82.07 crore a year ago. However, it posted a 48% jump in profit (Rs 694 crore) in 2010-11 compared with Rs 468 crore in 2009-10. The company's debt/equity ratio dropped from 1.34 on March 31, 2010 to 0.77 at the end of March 2011. Its cash balance also increased from Rs 809 crore in March 2010 to Rs 902 crore in March 2011. At 12.5 times the forward 2011-12 earnings, the stock is trading at relatively cheaper valuation. The estimated return on equity (RoE) for 2011-12 and 2012-13 is 33% compared with 30% in 2010-11. Dish TV, a Zee Network Enterprise group, is the leader in direct-to-home (DTH) entertainment services space in India. It had a subscriber base of 10.44 million at the end of March 2011 quarter during which it added 1 million subscribers. The management expects to add another 3-3.5 million subscribers in 2011-12. According to Emkay Global Research, the DTH industry is estimated to grow at 23% compounded annual growth rate (CAGR) over four years, with subscriber base growing from 33.7 million in 2010-11 to 63.3 million in 2013-14. "The regulatory push for digitisation in India will add significant value in the overall DTH industry. Dish TV is the market leader and has very good penetration and visibility. With company turning cash positive and the Industry slated to grow in double digits, the overall earnings would increase dramatically over the next few years," says Avinash Nahata, head, fundamental desk, Aditya Birla Money. Performance and Valuation: Higher subscriber addition and strong ARPU (average revenue per user) growth enabled the company to record a 32.5% revenue growth to Rs 1,436 crore in 2010-11. The company revenue is estimated to grow at 25-30% in the next couple of years. In the first quarter of the current financial year, the stock had already zoomed 35% from Rs 67 on April 1, 2011 to Rs 90 on July 8, 2011. Oberoi Realty is a real estate company with a focus on premium category residential and office space development. A Rs 7,000-crore market-cap company, Oberoi Realty sold 0.28 million square feet (msf) in March quarter of 2011 compared to 0.15msf in the previous quarter. This was mainly on account of 0.27msf (15% of total) of new sales in Esquire (Exquisite II) residential project in Goregaon in Mumbai. The company continues to focus on Mumbai as it says the city "is an attractive real estate market in terms of returns on investment, with both depth of demand for quality real estate developments across segments and price points and entry barriers for new players." The company is developing 10 million sq feet, mostly in Mumbai and hopes to double this by March 2013. It is also looking to expand in cities such as Delhi, Bangalore and Pune. Performance and valuation: The company posted a net profit of Rs 170 core in 2010-11, a jump of 603% over the previous year. Total revenue of the company jumped from Rs 45.31 crore in 2009-10 to Rs 439.52 crore in 2010-11. At twelve-month trailing PE of 45, the stock looks expensive even among its peers (HDIL at 7.40, DLF 30, Unitech 16.57 and Jaypee Infra 4.82). However, high cash levels, zero debt, strong guidance and premium category business model make it a worthwhile buy for the long term. United Phosphorus is a Gujarat-based pesticide and agrochemical company with 75% of business coming from global markets. Europe and North America are its major markets with the two regions accounting for 43% of its revenue in 2010-11. It recently acquired 50% stake in Sipcam Isagro Brazil (SIB) from Isagro. SIB specialises in manufacturing and distribution of formulations, with strengths in insecticides and fungicides. A Unicon research report suggests this unit would drive 3-4% revenue growth for the company in 2012-13. Performance and Valuation: In 2010-11, the company's share prices remained flat with 0.17% return (Rs 149.85 on April 1, 2010 to Rs 150.4 on March 31, 2011) compared with 55% (from Rs 104.65 to Rs 149.45) a year ago. On July 8, 2011, the stock was trading at Rs 155, up marginally from its April 1, 2011 closing of Rs 149. At present, the stock is trading at 8.5 times the estimated 2011-12 earnings, which looks attractive in terms of valuation. The company has given a modest guidance of 12-14% revenue growth for 2011-12. According to Emkay Global Research, the company may spring a pleasant surprise in 2011-12 given the normal monsoon predictions. Good monsoon predictions combined with recent overseas acquisition and likely improvement in European demand make a strong case for future growth of the company. Biocon is a healthcare company with focus on R&D of biomolecules and biopharmaceuticals. It provides drug discovery and developmental services to pharma and biotech companies. It has a strong R&D capability and new products in the pipeline. The company also expects to increase its global presence through strategic licensing partnerships, under which a firm gains the right to exploit the intellectual property of others. In 2010-11, the company generated Rs 155 crore through licensing agreements. Biocon has entered into a licensing agreement with Pfizer, Ireland, for worldwide development and supply of biosimilar insulin products. "Promoters of Biocon own over 60% in the company, which shows their strong commitment to deliver growth." It delivers products and solutions to customers in approximately 75 countries across the globe. The company has completed phase III trials of T1h molecule (a molecule that blocks the activity of the antigen responsible for Rheumatoid Arthritis) and its analysis is awaited. Phase I trial of BVX20 (a molecule for the cure of cancer of lymphoid organs) is likely to get started this financial year. Performance and Valuation: The company reported a 17% growth in sales to Rs 2,814 crore, and a 25% growth in net profit to Rs 375 crore in 2010-11. The share price went up from a low of Rs 89 in March 2009 to a high of Rs 472 in October 2010. It subsequently declined to Rs 301 in February 2011 and is now trading around Rs 360. At trailing 12-month PE of 15.30, the valuation of the company is also attractive. Educomp Solutions has been the leading player in the e-education space since its launch in 1994. It provides education solutions to 26,000 schools and reaches to 15 million students and teachers in five countries, including Canada and the US. "Educomp has grown at a compounded annual growth rate of more than 89% since its launch. It has recently diversified beyond school education into higher education," says Vinesh Menon of Bajaj Capital. According to Religare Capital, education remains one of the most attractive multi-year growth themes in India, with two key growth segments: multimedia (Rs 5,280 crore by business 2014-15), and K-12 schools (Rs 1,27,000 crore business by 2014-15). Performance and valuations: While revenue grew 23% in 2010-11 to Rs 1,020 crore, the net profit jumped 75% during the year to Rs 389 crore. The management expects a revenue growth of Rs 1,760 crore for 2011-12 against Rs 1,020 crore in 2010-11, a growth of 72.5%. The stock is currently trading at 12-month trailing PE multiple of 9.5.